At this week’s Intel Developer Forum, we’re unveiling ConsoleTab. We expect pre-orders to roll out later this week with full specifications and features. ConsoleTab™ is the first tablet to be sold in the United States that brings together Windows 10 and Android in one device. It’s powered by an Intel Atom “Cherry Trail” processor. And, thanks to many late nights of working with our partners, we expect to roll out a planned Android 7.0 Nougat upgrade early next year. We want to make clear that Intel is committed to Android. As such, we’re the first to commit to a planned Android Nougat upgrade for our device. We expect the Cherry Trail processor to be the little CPU that could, and we expect it to keep working with Android over the next few years to come. The firsts don’t stop at the Android stack though. We wanted to make tablets more affordable with storage, so ConsoleTab will pack up to 200GB of storage onboard, at an affordable price-point. Some tablet makers charge hundreds for that as an option, we expect to charge just $50. We’re pretty confident that ConsoleTab will break new price barriers in high-capacity tablet storage. And we made sure every ConsoleTab could have a kickstand, via a reversible docking keyboard. 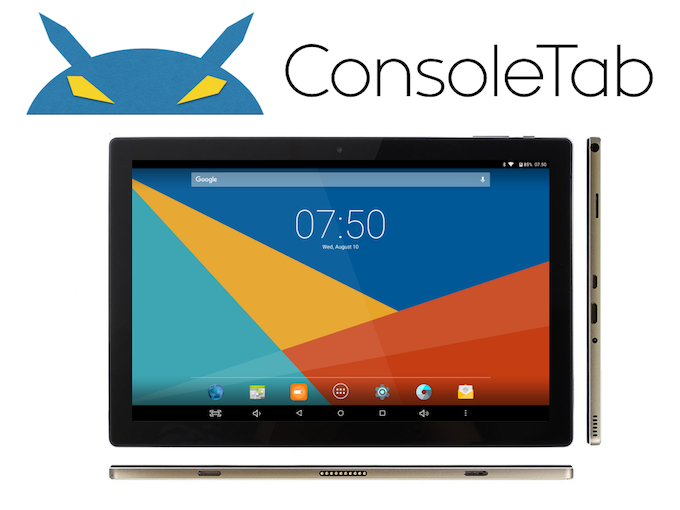 This is the first product built with our joint effort between Console and Teclast. Production, maintenance, and the design is a joint effort of both companies. We took one of Teclast’s existing designs, and made it even better. We took a standard Teclast tablet and tore it apart – literally. We selected different internal components that work better and are federally-certified for US and EU use. We also focused on the small stuff – like weight distribution between the tablet and keyboard. And, we wanted to make sure people never were without power when they needed it. So we modified the keyboard to have a physical reserve power switch. This ensures that the tablet will be able to use the keyboard’s auxiliary battery when you need it, and not drain through when you don’t. Finally, people who pre-order won’t be charged until their specific ConsoleTab is in production – ready to be sold. And, people who pre-order will get to vote on the final color for ConsoleTab – Kinetic Blue, Reflective Gold, or Matte Black. We’ll have a lot more to talk about ConsoleTab (from full specifications, to pre-order details) later this week. We expect pre-orders to open later on in the show, with discounts for signing up early. Kickstarter backers, we haven’t forgotten you. For backers of our previous Kickstarter, you’ll get 2x your backer amount (up to $100 off) or a cash refund, your choice. Details coming soon. Legal: ConsoleTab™ has not yet been certified by the Federal Communications Commission. No orders, pre-orders, or purchases for ConsoleTab™ will be charged, completed, confirmed, or processed, until certification has been obtained. Android, Atom, and Windows are trademarks of Google, Intel, and Microsoft, respectively.